The NHL playoffs kick off tonight and I still argue that it’s the best postseason in all of sports, this despite the little known fact that hockey is NOT my favorite sport. Go figure. The fact is, no other sport offers a war of attrition to earn the championship like hockey does. It’s pretty awesome. It can be even more awesome this season when you get involved in the action at the different New Jersey legal sportsbooks. We recommend checking out PointsBet because they are currently offering a $50 free bet with no deposit with code BROADLINES. While the Flyers aren’t there this year, which isn’t a surprise, that doesn’t mean you can”t enjoy the playoffs. As a matter of fact, they should be a lot of fun, especially in the Western Conference, where nothing would surprise me. The East is a bit more chalky, although I do think three of the four first round series can be pushed to the brink of a seventh game. Still, the East is top heavy and ultimately, one of the top four teams will reach the Final. I’m not a peerless prognosticator. In my years of making playoff predictions, I have had seasons where I’ve been superb picking series results in advance and I’ve had years where I like to forget I even made selections. And while I will give you my first round picks here as well as my Finals prediction, that’s not the purpose of this post. Feel free to bet my picks but do so at your own risk of peril! Haha. Instead, I wanted to offer you some perspective, so you can make your own educated betting choices as you decide how best to spend your dollars. So without further ado let’s get to the matchups and then after that, I’ll give you a few other things to look at when betting individual games during the opening round. If you or someone you know has a gambling problem and wants help, call 1-800 GAMBLER. 21+. NJ only. Eligibility restrictions apply. See website for details. Big bets coming in on Tiger Woods this week, including $85,000 at 14-1 to win #themasters at @WilliamHillUS. That bet would win $1.19 million. It's the largest individual liability on a golf bet in company's history. Here’s the current betting odds for woods at some of NJ’s most popular online sportsbooks. DraftKings currently offers Woods at +1400 and PointsBet checks in at +1500, but the best buy is over at FanDuel where you can get him at +1800. However, for a limited time, DraftKings is offering a Tiger Woods odds boost at +2000– that’s where the play is if you like Woods. 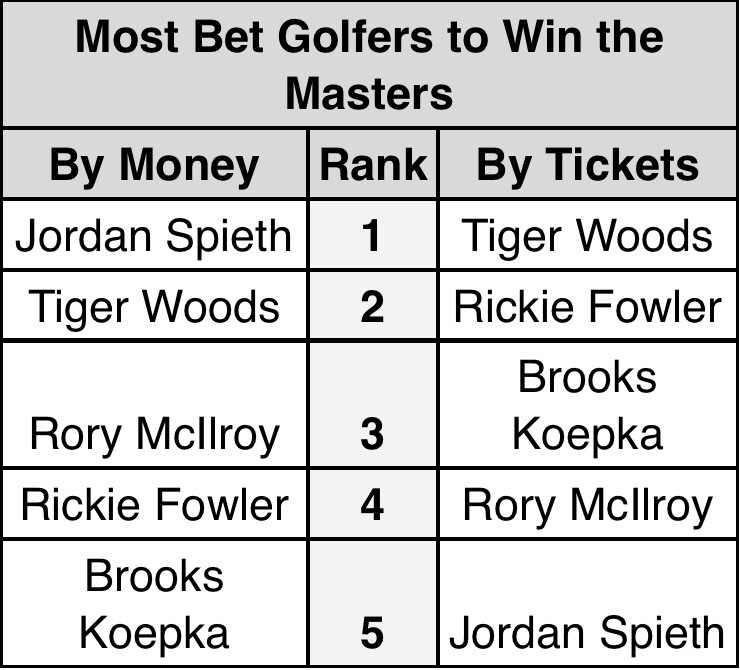 Woods is currently the fourth-biggest favorite to win the tournament at all three sportsbooks. One more thing. If you like Tiger and think he will get off to a hot start, be sure to take advantage of PointBet’s Instant First Day Winner promo. If your selection for the tournament winner is leading after Thursday’s opening round, PointsBet will pay you out in full on bets up to $200. You can get that offer and a $50 free bet with no deposit with code BROADLINES. Even better, you can get Tiger, or anyone else, at 100-1 odds at FanDuel. The public may be rooting for a Woods redemption story over the weekend, but I can definitively tell you that William Hill Sportsbook won’t be. Combined action on Tiger Woods and Rory McIlroy represents 32% of the total handle for #TheMasters at 100+ @WilliamHillUS sportsbooks…..
Also be sure to check out our Masters betting preview video. The 2019 Masters is nearly upon us, and thus it is almost time for fake bird noise to be pumped into your television sets by a production truck, along with plentiful mentions of Amen Corner and Tigers Woods’ major drought. Indeed, all of this makes for a tradition unlike any other. We’ve put together our full Masters Betting Guide and detailed how you can get 100-1 odds on any golfer, but let’s take a look at another strong offer from a New Jersey online sportsbook. PointsBet is offering a $50 free bet with no deposit and up to $1,000 in risk free bets with promo code BROADLINES, which might be a better deal than those fan-friendly concession prices at Augusta National. That, however, isn’t the only offer worth taking advantage of. If you’re like me, you probably enjoy constant action and quick results. Lock in the bet, win, reload, and build the bankroll (or lose and chase, but we’re keeping this positive). That’s exactly why I love PointsBet’s “Lead After Day One, Get Paid Instantly” promo. Pick any player to win. If your player is winning at the end of first day, you get paid out immediately. Best of all, this offer isn’t capped at a modest $25 bet. PointsBet allows bets of up to $200 on this deal. You can get the PointsBet Masters offer here. Jump in on one of the favorites, like Dustin Johnson at +1100, or back a longer shot like Adam Scott at +4000, win, and get back into the action before Friday’s round. Or, if you back a lemon who has a brutal Thursday, don’t delay the inevitable. Just take the “L’,” get back on the horse and find a winner. And also take a look at our complete Masters betting guide before locking in your picks. There’s plenty of betting options available at New Jersey sports betting sites for those looking to get involved with tonight’s NCAA National Championship game between No. 3 seed Texas Tech and No. 1 seed Virginia. Among those options is PointsBet, which is easily one of our favorite new sportsbooks because of its easy-to-use interface, wide-ranging wagering selections, lucrative bonuses, and cool promo offers. PointsBet can’t guarantee you’ll win your bet, but it will guarantee you won’t needlessly pay juice thanks to +100 spreadlines and totals on tonight’s title tilt. What does this mean for the average bettor? Users looking to win $100 will likely risk $110 to do so, but PointsBet is waving that fee, so they will only have to risk exactly what they want to win. More experienced sports bettors know that over time juice adds up, so be sure to take advantage of this offer, along with their Make it Rain promo, which will pay you $3 for every three-pointer your team hits (minimum $100 bet). PointsBet is also offering a $50 free bet with no deposit and two risk-free bets up to $1,000 when you use code BROADLINES. As for our thoughts on the game, be sure to check out our complete Texas Tech-Virginia Championship Game betting guide before locking in your plays. The Final Four is upon us and NJ sports betting sites are offering a range of action on Virginia Tech-Michigan State and Auburn-Virginia, including odds boosts, promos and more. Here’s what you need to know and the best bonuses for new players. DraftKings Sportsbook is the most popular betting app. We’ve compiled a full DraftKings Final Four betting guide, but what matters most is that they are offering their best signup bonus in a while— $550 in first bet matches. This replaces DraftKings’ regular offer of a $500 first bet match. New users who deposit at least $5 will get their first Final Four bet matched up to $50 with a second bet that can be used on the National Championship. You can actually split the $50 and apply it to multiple bets as long as they are on the same bet slip. In addition, any other bet is matched up to $500– DraftKings’ regular offer. You can get the offer here. PointsBet is the best new betting app in New Jersey. As a company, PointsBet puts the user first. And while that may sound like lip service, you can sense the difference from the moment you open the app. They routinely offer good karma payouts for crushing blows, their customer service is top-notch, and there’s immediate value in the lines. PointsBet offers the best signup bonus in the industry, available exclusive to Crossing Broad readers— get a $50 free bet with no deposit and then up to $1,000 in risk-free bets with promo code BROADLINES. There’s more: PointsBet offers the lowest juice of the Final Four— all spread and moneyline bets on the tournament are -105. The best you can find elsewhere is typically -109. This might seem like a small thing, but over time this extra savings can be the difference between being in the red or the black… which just happen to be PointsBet’s colors. For the tournament you can also take advantage of their “make it rain” bonus, which will pay you $3 for every three-pointer your team hits on a spread bet with a minimum of $100. FanDuel Sportsbook grants new users a $500 risk-free bet. Beyond that, they have a “bet $25, get $25” Final Four bonus. If you place a $25 pre-game spread bet for any Final Four game, you’ll be given a $25 bonus if you win. Beyond that, FanDuel offers a range of Final Four odds boosts to go with their recurring boosts and bonuses. As the recent leader in NJ sports betting, FanDuel is worth checking out. You can get the risk-free bet offer by signing up here. BetStars is lesser known than its peers, but they offer a clean interface and consistent boosts and promos, making them worth checking out for those in search of value. Anecdotally, we find their lines tend to differ most from their competitors, so that’s always welcomed. BetStars is offering a $20 free bet to new users and any current users who didn’t make a deposit yet. You can get the offer here. In addition, they offer a bunch of odds boosts— but be careful, sometimes their boosts aren’t as good as regular odds that can be found elsewhere. We’ve put together a full post with betting analysis for Texas Tech-Michigan State. But Michigan State is a 2.5-point favorite, down from 3 when it opened. PointsBet tells us they are taking an overwhelming majority of bets on Texas Tech. The over-under is 132. We’ve also put together a betting guide for Auburn-Virginia, but Virginia holds steady as a 6-point favorite with an over-under of 131.5. DraftKings tell us most of their action is on Auburn. The Final Four may mark the last time New Jersey sports betting sites can capitalize on a big major sporting event for a while. While the Masters next week will certainly represent a huge activation period and the NBA playoffs are sure to generate betting interest, March Madness provides the last contained event of the major sports to take action for some time, so it’s likely these will be among the strongest signup offers new users can expect. Also worth considering is that PA sports betting should launch before NFL season, meaning Pennsylvania bettors who might drive over the bridge to bet won’t need to do so anymore. This is a big weekend for New Jersey betting. And the ball is tipped! DraftKings Sportsbook is rolling out the red carpet and throwing the kitchen sink at Final Four betting in New Jersey this year. They are offering a range of betting options, odds boosts at props for the Final Four games between Texas Tech and Michigan State, and Auburn and Virginia. PointsBet NJ today announced an update that will bring Face ID and Touch ID to their iOS app, along with pick-your-own bet options and cage deposits. One of the more frustrating aspects of online sports betting in New Jersey is the constant need to log in to an app. This isn’t a feature of any particular sportsbook– rather it’s a function of regulatory requirements to assure apps aren’t being used by minors, among other security concerns. With that level of security, however, comes the frustration of having to log in to an app you may have just used 20 minutes earlier. Face ID and Touch ID tools radically speed of this process – as anyone who uses it with a banking app knows – and now PointsBet will be able to do the same. After you update the app and then sign in, you will be prompted if you would like to use a pin and Face ID. If you select yes to both of these options, you will then be able to use those methods to log in in the future. Now there is a “Name A Bet” tab which compiles markets from potential bets submitted by users to PointsBet. You can contact them through Twitter (@pointsbetusa) to offer up action, and they may choose to give you odds on it, which you can find under this tab in the app. This is a really cool feature if there is something you want to bet on but don’t see it offered. Simply ask PointsBet and they may give you custom odds. You can now do Meadowlands cage deposits and withdraws at PointsBet’s Meadowlands window. This is a big deal for those who have trouble making deposits or withdraws. This is a bit more of a nebulous update, but anything to improve upon the deposit experience is welcomed. This has been a sticking point in New Jersey as some credit cards and banks don’t want to allow gambling transactions. PointsBet is doing their best to move the ball forward in this regard. Full disclosure: We are an affiliate of legal New Jersey sports betting sites, so we may receive a commission if you use our links. The Stars Group will bring its sports betting brand, BetStars, to PA online sports betting. My. Airy Casino and Resort, which last year announced a partnership with BetStars, was one of two casinos along with Mohegan Sun Pocono to file a petition for their sports betting certificate. Each casino would have to pay a $10 million license fee if they are approved. Unlike SugarHouse Sportsbook or Parx Sportsbook, Mt. Airy probably doesn’t have strong enough brand recognition to launch its own betting app in PA, so last year it struck a deal with The Stars Group, owners of PokerStars, to use the company’s sports betting app, BetStars, as a skin in PA.
BetStars is live in New Jersey and falls somewhere in the middle in terms of revenue and popularity. It was plagued with deposit issues early on but has since been updated to allow more customers to deposit more quickly and easy. The BetStars interface is instantly familiar and easy to use, which will be a great benefit to novice bettors in PA.
Mohegan Sun Pocono also filed its application, according to CitizensVoice.com. They had previously announced a partnership with Kindred Group, owners of Unibet, the popular European brand which will headline the partnership with Mohegan Sun. That brings the total number of expected PA sportsbooks to nine. Several local sportsbooks have reached out to us and indicated that online sports betting in Pennsylvania may be imminent. News of these two additional filings certainly indicates that may be the case. With the NBA playoffs around the corner and the Phillies starting hot out of the gate, the major sports market that is PA could be about to get its first taste of legal online betting. And now it has two more likely apps to add to the mix.